Coming February 26, 2015 the anthology that I love love love! 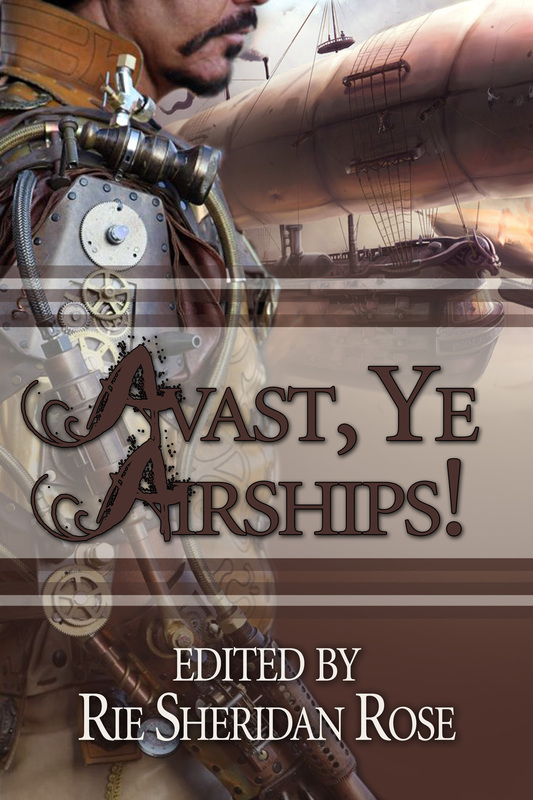 Avast, Ye Airships!, Edited by Rie Sheridan Rose. I love even more that I actually did make it in! Why the vote of no confidence in myself? Steampunk is a genre that I came to a few years ago. Rie, actually, is the one who suggested Gail Carringer to me, and it was love at first read. But it’s not especially in my wheelhouse, writing wise. I’ve never attempted anything other than traditional fantasy or paranormal/urban fantasy. And on the last, I just finished the first complete manuscript. So. We have a sub-genre that I love, but am wholly intimidated by. How does a poor writer deal with that? One of the things I have been really wanting to do was a tribute to The Secret Garden by Frances Hogson Burnett. Not a straight retelling, but more of a nod to a story that meant so much to me growing up. Since receiving my first copy (coughcough) years ago, I have never been without it. It speaks to me. I will try to get my fellow pirates to come over and play with us, too! Talk to you soon, my lovelies! I’ve seen this book a lot– the Nook app was forever recommending it, but I resisted. I had tried steam punk written by men before, and it just didn’t have the same soul that I loved in the female version of the genre. This one didn’t have the same soul, either… But that’s ok. Cuz I liked it. Yes. You heard me right. I tried something new and I liked it. At first I was like… What the Heck? Because by today’s standards, Gideon Smith is naive. So, so naive. But that what makes it great. It’s immersing yourself in what I imagine penny dreadfulls were. Just a great, rip roaring adventure. Gideon’s naivete is the perfect foil for his more damaged comrades. It’s a tight balance that has to be maintained by the author, and he does it well. I’m not sure how the followup novel will work, because some of that naivete will be lost, but I’m looking forward to finding out how it’s handled. I’ll be back later in the week with some thoughts on Mercedes Lackey. In honor of my very good friend, Rie Rose’s release of The Marvelous Mechanical Man, we’re gonna look at steampunk. It’s surprisingly appropriate, since she is the one who first turned my attention to the sub-genre. The Marvelous Mechanical Man By Rie Rose. I love the heroine, Jo Mann. Jo is resourceful, bright and has sass to spare. Professor Conn is the classic absent minded variety, except… Except when he isn’t. Like when he agrees to hire Jo as his assistant J This book hooked me from page one and kept me there until the very end. Can’t wait for the next book! Hey Rie Sheridan Rose! We want more Conn-Mann! A note about this book. The book is set in New York City. It’s one of the very few steampunk novels set in America that I like. Mostly, I like the Victorian England ones, although I can’t put my finger on why. It could be that since I already live in the US, I enjoy living vicariously through my heroines. However, this one was done so well, that I really didn’t miss tea time much at all LOL. Gail Carriger, the Parasol Protectorate series (incl. Soulless, Timeless, Heartless, etc.). Alpha werewolves? A No-nonsense heroine? Check and check. Great series, I devoured them all. If you like steampunk, with a shot of feisty heroines and sometimes, a romance… Give any of these authors a try. It’s well worth it. And if you want to go catch my short, short mood vampire piece, you can grab it over at the MMP blog today. Pop back in and let me know what you think. Have you read any of the above titles or authors? Do you like steampunk? What authors/titles do you recommend? What do you like about the genre, and what drives you batty?